DES MOINES, IA- The Iowa Barnstormers (4-9) fell to rival Cedar Rapids Titans (10-4), 46-23, Saturday night at Wells Fargo Arena in Des Moines, Iowa. The Cedar Rapids Titans were the first to score when kicker Nicholas Belcher made a 19 yard field goal, 3-0. The Barnstormers were quick to answer as quarterback Travis Partridge made his way into the end zone from seven yards out, 7-3. The Titans regained the lead when quarterback Dylan Favre found receiver DeJay Lester on a 23 yard touchdown pass, 10-7. The first quarter ended with Favre finding Lester for a second score this time from 15 yards out, 16-7. After the Barnstormers were unable to get the yardage for a first, the Titans were able to find the end zone as Favre scrambled in from five yards out, 23-7.The Barnstormers cut the deficit when kicker Jimmy Allen nailed a 32 yard field goal, 23-10. The Titans answered with a touchdown pass, 30-10. The Barnstormers defense prevented a score with under a minute left in the quarter when linebacker Javicz Jones busted through the line and blocked a Nicholas Belcher field goal attempt. The half ended with the Barnstormers trailing, 30-10. The Barnstormers started with the ball coming out of halftime, but their drive ended with a dropped pass in the end zone on fourth down. The Titans put another score on the board with just over eight minutes remaining in the, 37-10. The third quarter came to a close with Titans adding two more points by way of safety, 39-10. The Barnstormers found life in the fourth quarter when defensive back and Week 15 defensive player of the week Derrick Morgan intercepted a pass in the back of the end zone. 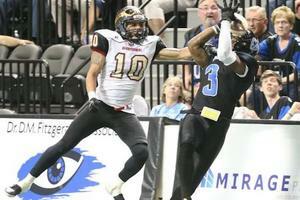 The Barnstormers capitalized when Partridge found receiver Brady Roland on a 45 yard touchdown, 39-16. The Barnstormers attempted a comeback with an onside kick recovery. The Barnstormers found the end zone when Partridge connected with receiver Lucas Hefty, 39-23. The Titans scored in the closing moments of the game, 46-23. Next week the Barnstormers will be on the road to take on the Sioux Falls Storm (13-1). The Barnstormers will be back at home on June 18 as they get set to take on the Wichita Falls Nighthawks (9-4).